SOIOP dynamo Pat Wiemken provides a fun photo showing Ohme opposites - the "large and small" of Hermann Ohme - being an Eglantine handled vase next to a very small Worcester cup on an Eglantine saucer. Ohme's Eglantine vase is not a meek vase. It stands 15 inches tall, and is about 8 inches wide at its widest point. The top of the vase has the Eglantine "ruffled edge", and the base has the Eglantine "sawtooth" embossing. The handles are ornately shaped and extend well away from the vase body. 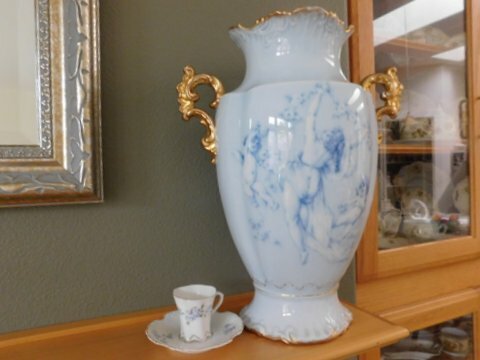 This particular vase has a very pretty design of an angel and cherubs on a robin egg blue background. The handles are finished bright gold. The Worcester cup is only 2 inches high, 2 inches across at the top, and only 1 1/2 inches wide at the bottom. Alma Hillman et al. 's "Old Ivory & Ohme Porcelain The Mystery Continues" on page 205 lists the cup as a saleman's sample. Whether a salesman's sample or merely a small cup in the regular line, it is a beautiful example of "dainty" porcelain.